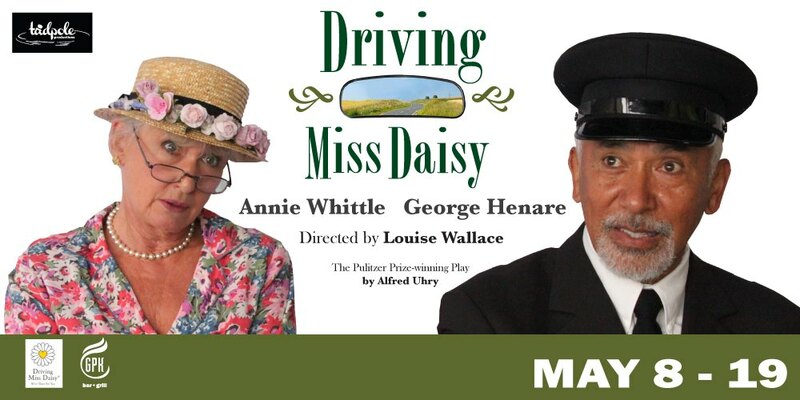 Two of New Zealand’s most iconic actors, George Henare and Annie Whittle join forces in the Tadpole Productions presentation of the classic Pulitzer prize winning play “Driving Miss Daisy”, to be performed at the historic PumpHouse Theatre on the shores of Lake Pupuke in May. Driving Miss Daisy will also feature Phil Peleton as Miss Daisy’s son, and will be directed by well-known theatre and TV personality Louise Wallace. Henare and Whittle follow legendary pairings who have showcased Alfred Uhry’s timeless play on stage and screen, such as Jessica Tandy and Morgan Freeman, Vanesssa Redgrave and James Earl Jones and, most recently, Angela Lansbury with James Earl Jones. Tadpole Productions was formed last year to bring quality theatre to the North Shore and 2012 saw two acclaimed plays staged by the group –“ The Lion in Winter” and “Last of the Red Hot Lovers”. 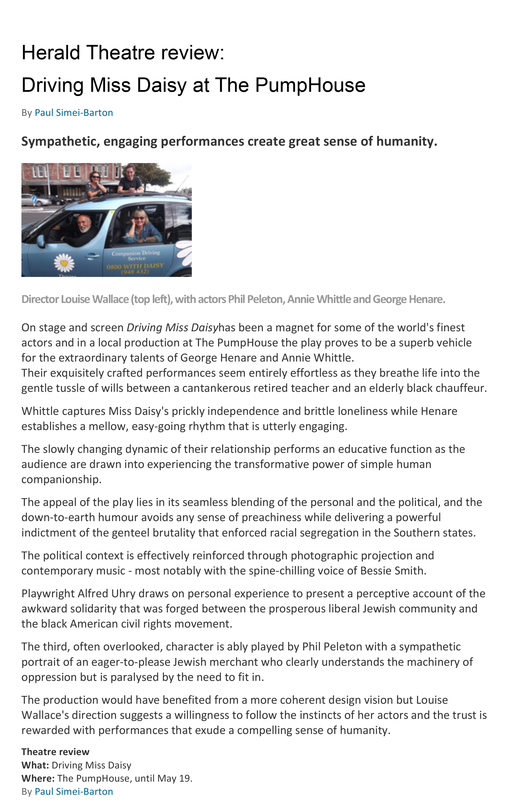 Auckland audiences are in for a treat with “Driving Miss Daisy”, their first show for 2013. Spanning 25 years, just prior to the civil rights movement, the story of “Driving Miss Daisy” revolves around the warm-hearted, humorous and affecting study of the unlikely relationship between a rich, aging, crotchety Southern widow and her proud, soft-spoken chauffeur, hired by her son to avoid further disastrous car accidents. A rare privileged for theatre audiences is at the Pumphouse. Witness three superb actors as they display their power, skill and craft in this Pulitzer Prize winning play Driving Miss Daisy. It’s a delicate and fragile play of race relation and growing old against a backdrop of the emergence of the Black Liberation in the 1950s and 60s. Annie Whittle is Miss Daisy. She completely becomes the elderly Jewish white woman from Atlanta with the will of iron and the frailty of age. She is compelled to take African American Hoke Colburn as her chauffeur and there develops the unlikely, long-lasting 25 year friendship. This Miss Daisy is accurate, intense and sparkles with southern charm and reluctant understanding. George Henare is Hoke, the ‘warm-hearted’ black driver, but in this role he brings so much more. This is a performance that is flawless, intelligent, witty and above all subtle. Henare has the lightness of touch that immediately engages. Every scene is fulfilled and the audience love and understand every breath. Phil Peleton is Daisy’s son Boolie and makes up the trio of experienced actors. He is as southern as his mother with more insight, intelligence and a sense of reality that his mother lacks. Peleton is as skilful as his more senior colleagues. He brings an honesty of character to each scene. He adds depth, total believability and a keen sense for the musical interplay in the duets. Driving Miss Daisy was written by Alfred Uhry, opening in 1987. It ran for over a thousand performances before being made into the Oscar winning film featuring Jessica Tandy and Morgan Freeman. The play was revived in 2010 in Broadway and is now on tour in Australia with Angela Lansbury and James Earl Jones. This production by Tadpole Productions gives Louise Wallace her first stage director credit. What a great premier. She has marshalled three excellent actors to explore the text with insight, truth and lightness. The result is a play with an ease of performance that is so rare on the Auckland Stage. Simple settings and imaginative use of well selected back projected images round out the fine direction. Perhaps more attention to the design could have been made. The barbeque ‘Bali’ chairs just reek of ‘Kiwi’, the wood benches lack the luxury and quality that the rest of the production oozes. The play is one hour and fifteen with no interval. An excellent night in the theatre to witness the power and humanity three skilled actors can create.